FlipFabulous Flipbooks, the latest trend in creating personalized on the spot party favors at events and parties. We provide not only a custom keepsake, but act as party entertainment as well. FlipFabulous Flipbooks is the perfect addition to any event. It’s the hippest interactive party favor out there, and your guests will think of your event each time they flip through their custom flipbook or show their friends. 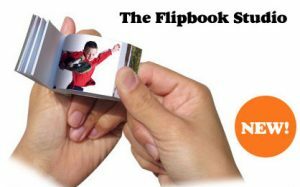 FlipBooks are a 3D Motion Flip Photo Album. We set up a portable FlipBook studio in a 10 x 10 area at your event. Your guests will take a 7 second video being as serious or silly as they wish. The photos are then Printed, Cut, and Bound into a 60 page Flipfabulous Flipbook with a customize cover. It all takes around 2 minutes, then they get to take it home with them. It is a gift worth a thousand words that will last a life time.